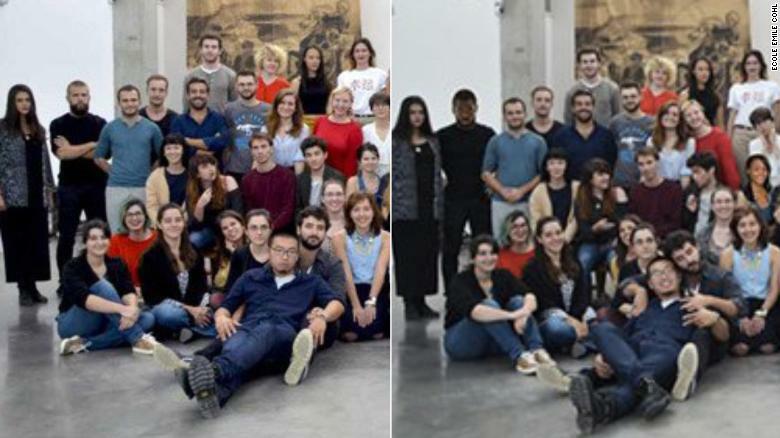 A well-respected art school in Lyon, France, is under fire for a recent advertisement in which white students' skin was darkened to give the appearance that the school had a more diverse student body. Additionally, it's been revealed that some students were removed from the image and fake minority students were Photoshopped in their place. The Émile Cohl Art School is opening a new campus in Los Angeles, and apparently someone felt that faking diversity in their advertisement photos would be a good plan for attracting more students to the new school. In the Tweet above from a former Émile Cohl student, you can see the original photo (left) and a doctored photo of the same group (right). You can clearly see a young woman in the middle of the image who is white in the shot on the left and black in the shot on the right. You can also clearly see two minorities added to the shot on the right. "The communication company decided on its own to darken the skin of some students to add diversity. The communication campaign was made from the U.S."
Though the faculty at the school didn't initially notice the changes to the photo, students immediately saw the changes and brought it to the attention of their teachers. For what it's worth, the school took measures to remove the website on which the image was featured and has stated that it will file a complaint against the company responsible for the manipulation of the photo. "The contract is over," Perrier stated in an interview with CNN. "American law is complex," he continued, "but we don't want it to stop there, we would like to file a complaint."